Crusader Auto Leveling System Worth it? Great idea and location...Is it working ok there now ? Very nice job on the relo! Nice job. I would be inclined to do that to mine as well but we store it in a storage lot and don't know if anyone would mess with it or not? I like the fact it's behind a locked door now but hate crouching down to work it. Looks good! It worked GREAT on our outing last weekend - MUCH more convenient. I too wanted security for the controller and simply replaced one of the thumb locks with a keyed lock, $7 and a 5 minute job. 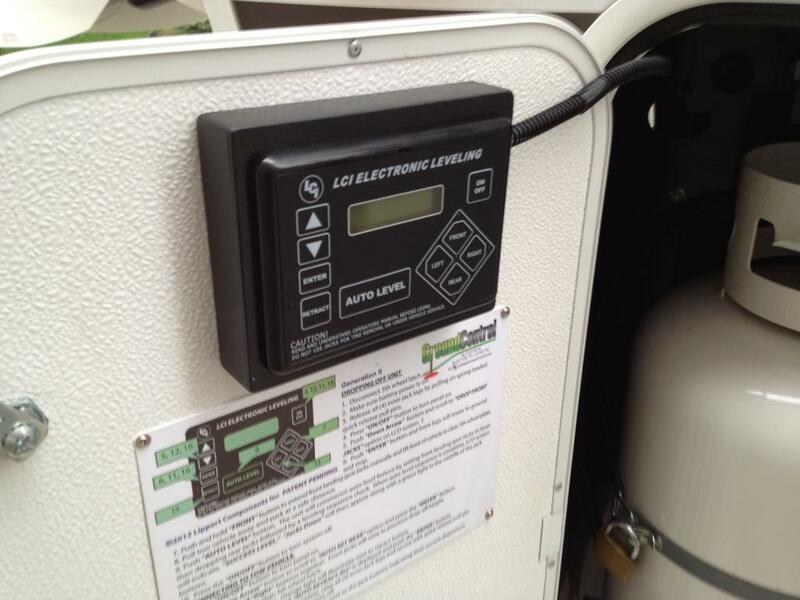 I went to an RV show this weekend to 'help' my brother shop for a new bunkhouse 5er, and saw the Ground Control leveling system control board mounted differently than it was in my Crusader. I had already moved it (earlier post), but was not sold on the new location being on the curb side, and liked the idea of having it on the back of a storage door similar to what I saw at the show. I decided to move it inside the left side propane storage compartment, on the back of the door. This may not be totally correct given the propane and electrical in the same area, but there are other electrical components in the same area (lights, and landing gear motor (!) very close). The control board is all semiconductors with no switching gear that would arc, plus the door will be open while in use anyway, so I thought this would not be an issue. I made a splash proof box out of some scrap stuff I had laying around, painted it black and mounted it to the door with double faced tape. It easily clears the tank when closed and is now very easy to access and see. I was fortunate to be able to move the instruction sticker to the door as well. One of my favorite mods so far. Propane is quite flammable and considered a hazardous material. LCI controller is fed with Chassis battery power up to 14+ volts DC, more than enough to provide an ignition source. Thinking of the numerous leaking regulators reported this year, its a possible risk. Possibly considering relocating my control panel also. 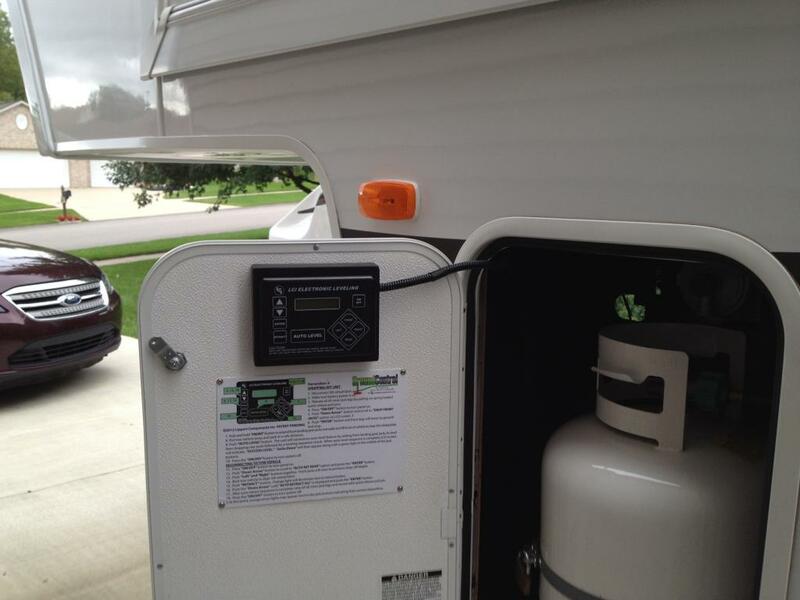 My propane storage compartment is completely open to the outside on the bottom and partially open on the front side. Since propane is heavier than air, would this potential location still pose a hazard? The only time at all if possible would be if you had power to the unit with the door closed. Your board shuts off after 3 mins of none use. Also look at the bottom of the locker there is holes in the bottom and also you should have a vent on the side of the unit. Granted you have 12V running to the panel. If you are worried just switch the 12 volt off to the unit. It's the same thing as your propane running to your refer or hot water heater, their is also 12V potential there and 110v at the refer. With propane always constant. Lowes sells some water proof boxs that you can mount on the outside. To me it would be pretty low on my list for things to worry about. Class I, Div. 1 - Where ignitable concentrations of flammable gases, vapors or liquids are present continuously or frequently within the atmosphere under normal operation conditions. Refineries and Ships come under Div 2 even out in open atmosphere. Can't predict a failure and volume loss. Not a Propane guy, just worked lots of Explosion proof and Intrinsic safe equipment as above. I don't know I am looking at a 2014 294 right now and it doesn't seem to be an issue where the factory puts the panel? Is there any reason to move it other than having to bend down seems out of the way where PT put it?